First and foremost: this book was something that I never anticipated (in a good way). I didn’t read the blurb, I only gushed over the cover and knew that I really enjoyed Caroline’s writing in her previous books so I just had to read this one. 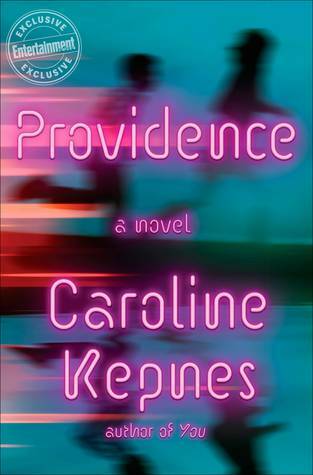 Providence was so much, all wrapped up into one book. I loved the multiple meanings it had, the metaphors, and the way Caroline created a human being like Jon. While I did rate this book three stars, it wasn’t for anything negatively done on Caroline’s part. It was simply because I was left unsettled and while I thought that was in a good way, maybe I was wrong. I think I wanted more answers than what we got. Which was none. Like with Joe (in YOU), you can’t help but to love and sympathize for Jon and Chloe. I didn’t so much as connect to Eggs and Lo as I probably should have but the story did okay for me, even if I didn’t much care for their POV. The best part though, is that Caroline’s writing is so “in your face” and very distinguished and I love that about her because she creates characters who captivate you in ways that you haven’t experienced before. i.e. Joe. I haven’t experienced characters like Jon before and I was very much drawn to him and the struggles he was facing and the ways that he coped and handled them. I really just struggled with the way the book ended. The way the last 15% of the book unfolded- I can’t explain it and that is hard for me as a reader. This was the part where I felt unsettled. Like I was missing something and I wasn’t included in the story line that was taking place. It felt like a “HA, I know something that you don’t know”. Also- maybe if I was more educated in Lovecraft it would have helped me. But as I was reading Providence I feared that researching Lovecraft would give me spoilers and I didn’t want that at all. I also have a really hard time classifying this as a thriller which is what I expected as I went in. I am most definitely curious of the other types of genres this could be classified as. Super-natural, maybe? And it doesn’t. There is always a reason and Providence showed the reason, or in Jon’s case, reasons. And those reasons broke my own heart. His struggle through life, I really feel like I felt that and connected with it. Caroline wrote so well that my pages kept turning and at some points I was holding my breath waiting to know what happened next. But something happened with me as I was reading. I wasn’t disappointed, but I had a bunch of questions…you know, the usual ones. But why? And how? When did that happen and where? I really enjoyed the story line that took place but I also really sad that I can’t say this was one of my favorites this year. Great review! This is one that I struggled with as well.